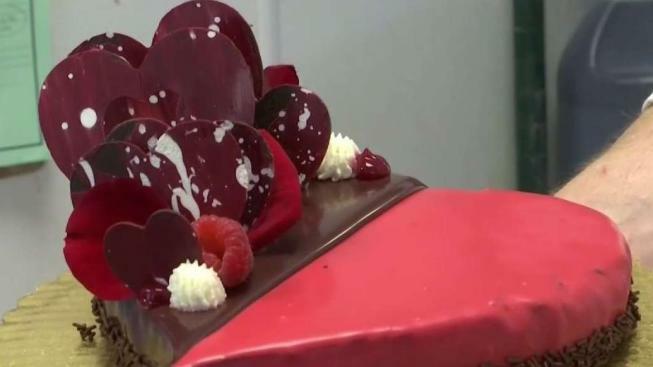 From bakeries to florists to restaurants, businesses across Connecticut are hoping to cash in on Valentine's Day on Thursday. Love is in the air and whether it's chocolates, flowers or a waterfront dinner, southeastern shoreline businesses spent the day before Valentine’s Day preparing to take on the day of love. Sift Bake Shop Owner Adam Young is ready to make people fall in love from chocolate desserts, to bon bons, truffles and special flourless chocolate cakes with raspberry ganache and raspberry and chocolate mousses —of course in the shape of a heart. “The power of a cookie, man. That’s actually how I sealed the deal with my wife is I just used to make her sweets all the time,” said Young. He’s making enough Valentine’s Day treats to last through Sunday. “It is Valentine’s week! So Valentine’s is essentially an entire week for us,” Young said. Earlier Wednesday there was already a very long line at his Mystic shop. But Valentine’s Day also goes hand-in-hand with flowers. “Flowers [are] love. Definitely. Flowers mean love,” said Michael Hoelk of Hoelck’s Florist. The Waterford-based business expects to make around 700 to 800 bouquets within the course of the week. Hoelck brings in extra staff on the big holidays and has one woman completely dedicated to roses. About 100 people come in on Valentine’s Day looking for flowers, too, according to Hoelck. “Crazy, crazy lines. Yes, we’ve been very fortunate,” he said. Many stopped in Wednesday, too. “One Valentine’s Day we decided we weren’t going to get each other anything. And I didn’t even get a card because I thought nothing meant nothing. That was a mistake,” said Fred Conley, of Waterford, who came in to purchase flowers. According to Hoelck, Valentine’s Day is the single busiest day for business, but the shop’s busiest holiday overall is Mother’s Day. Not everyone has a sweetheart, but people are sweet to mom. Other couples are more about a romantic holiday dinner on the water. Mystic’s Red 36 is offering a five course tasting menu for two, a new feature for the restaurant. And continuing with their Valentine’s Day tradition, diners can capture a snapshot of the night in the photo booth they bring in for the day. “I think it’s big for everybody, right? I mean, it’s love,” said Nancy Hankins, the floor manager at Red 36. While the restaurant is pretty booked for Valentine’s Day, Hankins said they work on fitting more reservations in and have a few unreserved tables, too.